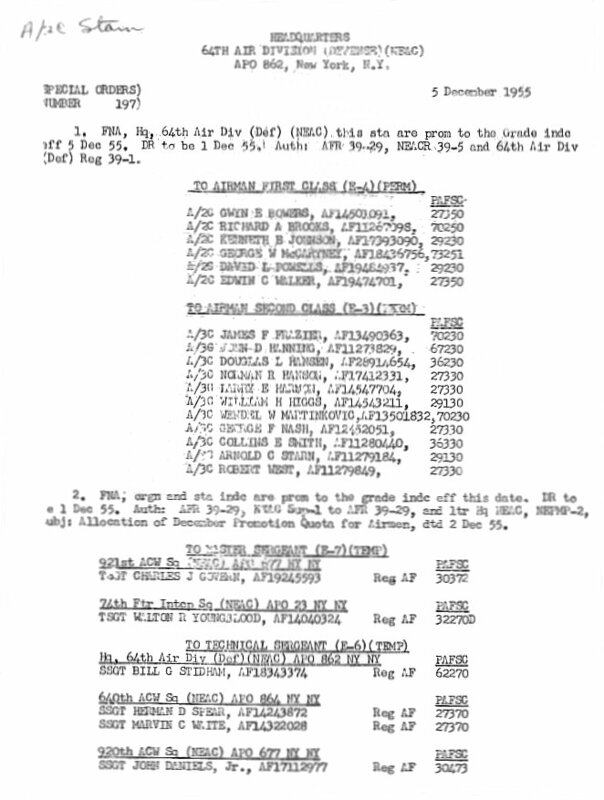 64th Air Division (Defense), Special Orders #197, page 1 of 2 - 5 December 1955. 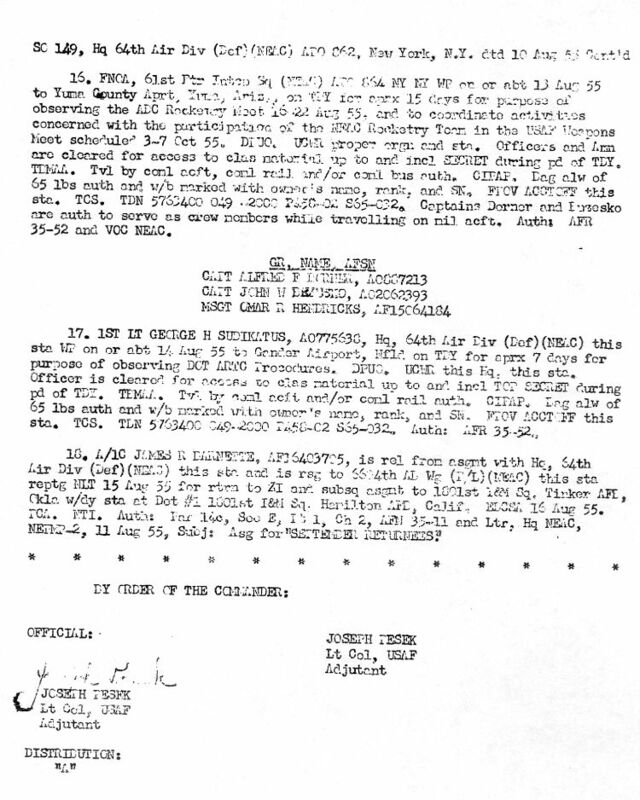 64th Air Division (Defense), Special Orders #197, page 2 of 2 - 5 December 1955. 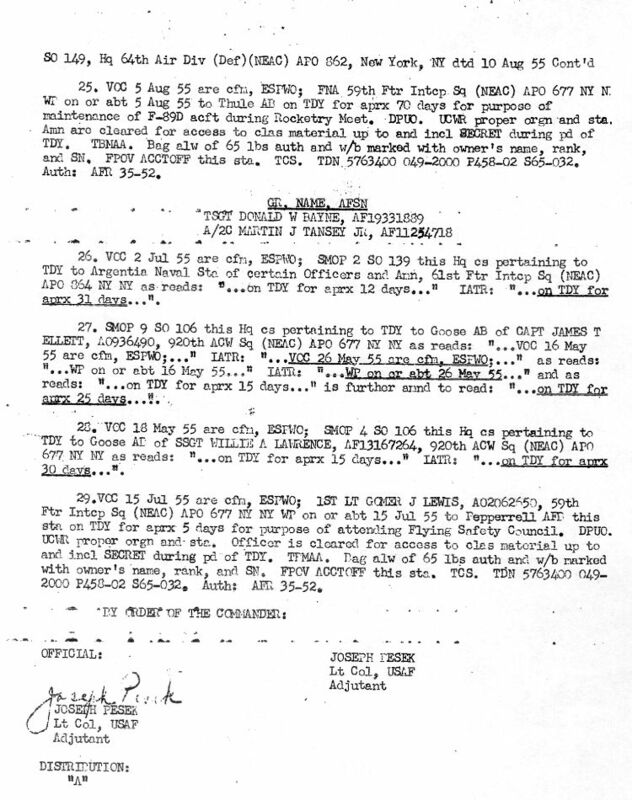 64th Air Division (Defense), Special Orders #149, page 1 of 8 - 10 August 1955. 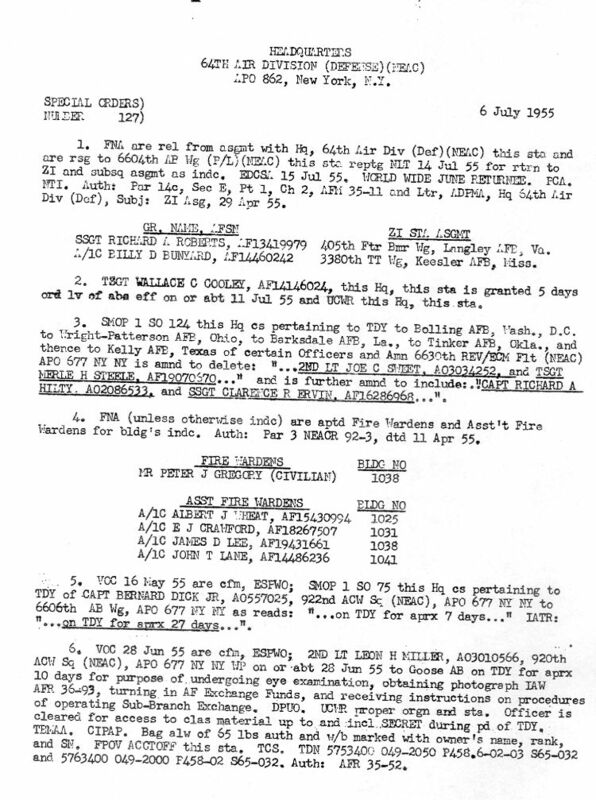 64th Air Division (Defense), Special Orders #149, page 2 of 8 - 10 August 1955. 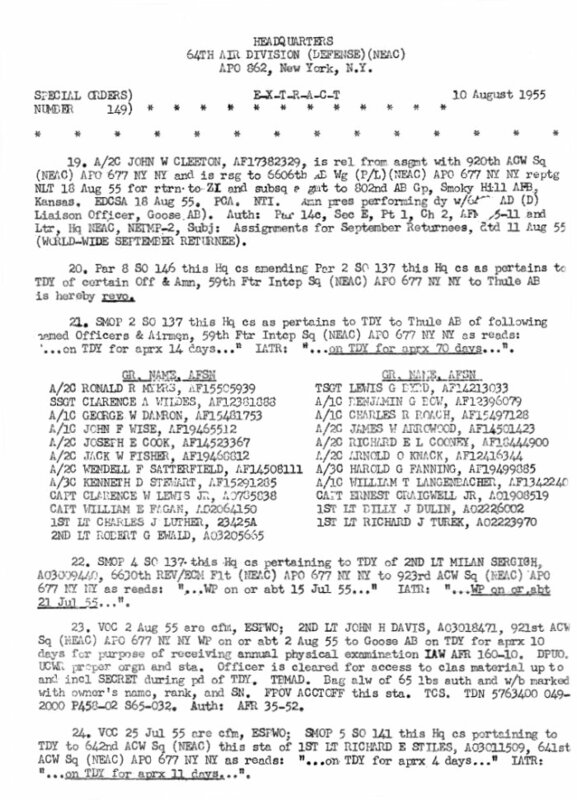 64th Air Division (Defense), Special Orders #149, page 3 of 8 - 10 August 1955. 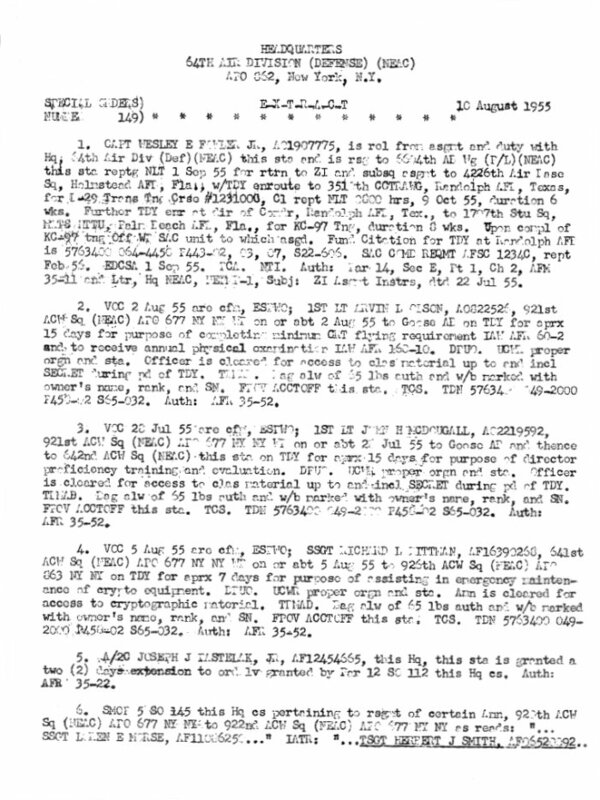 64th Air Division (Defense), Special Orders #149, page 4 of 8 - 10 August 1955. 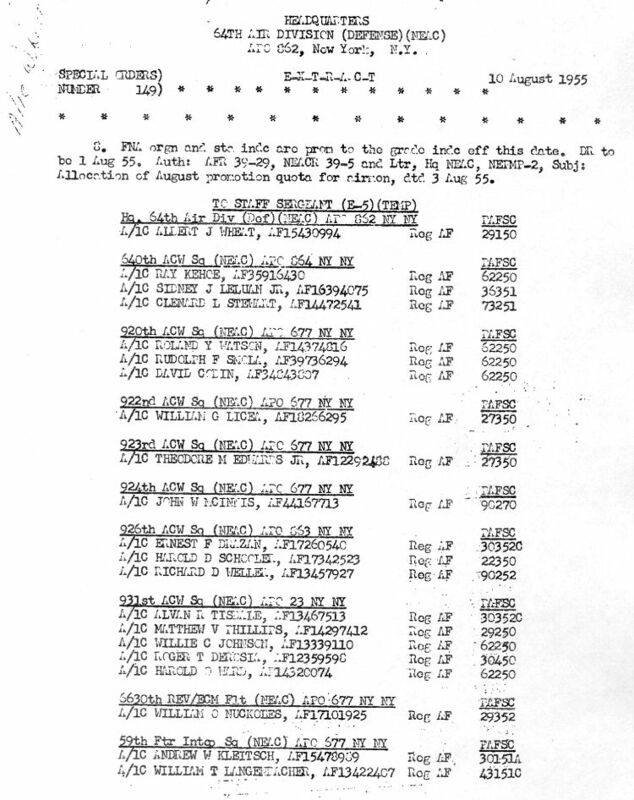 64th Air Division (Defense), Special Orders #149, page 5 of 8 - 10 August 1955. 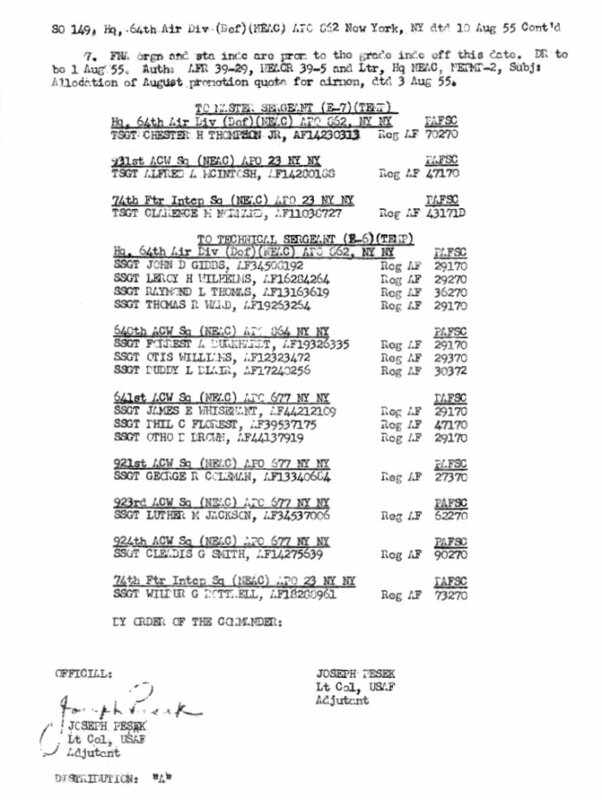 64th Air Division (Defense), Special Orders #149, page 6 of 8 - 10 August 1955. 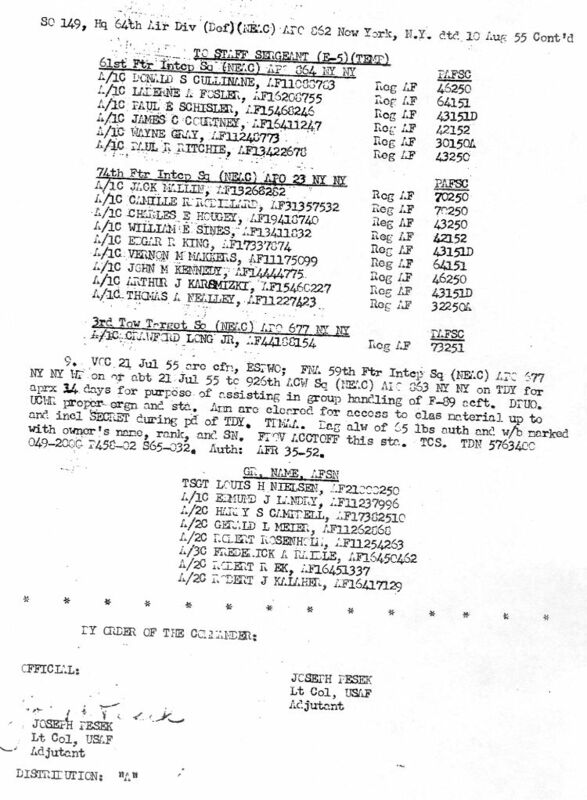 64th Air Division (Defense), Special Orders #149, page 7 of 8 - 10 August 1955. 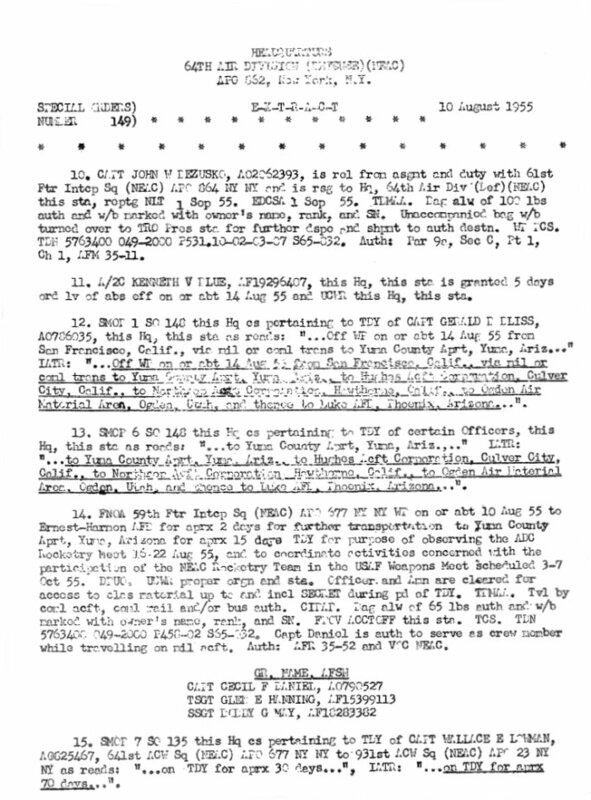 64th Air Division (Defense), Special Orders #149, page 8 of 8 - 10 August 1955. 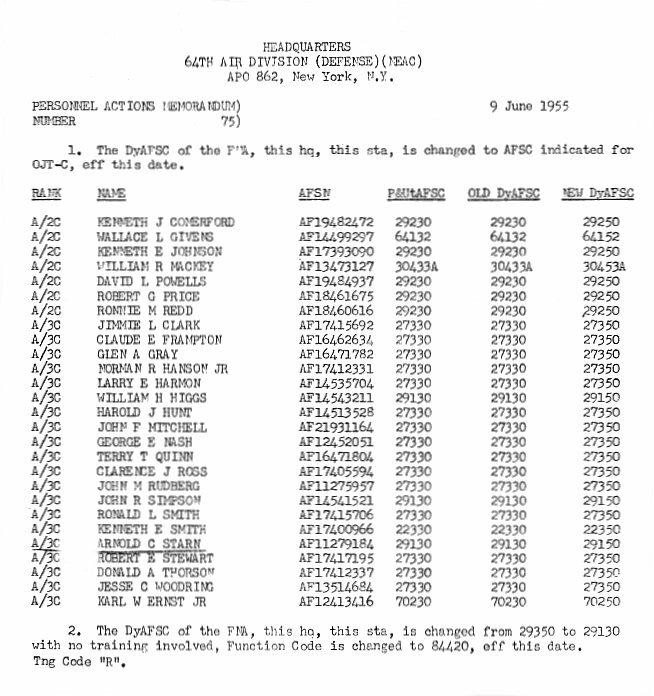 64th Air Division (Defense), Special Orders #127 - 6 July 1955. 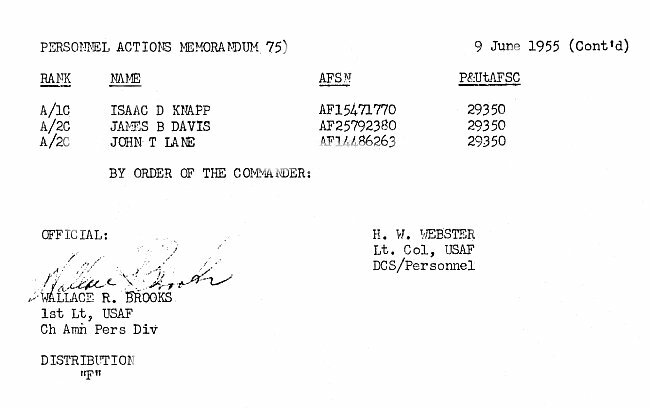 64th Air Division (Defense), Personnel Actions Memorandum #81 - 23 June 1955. 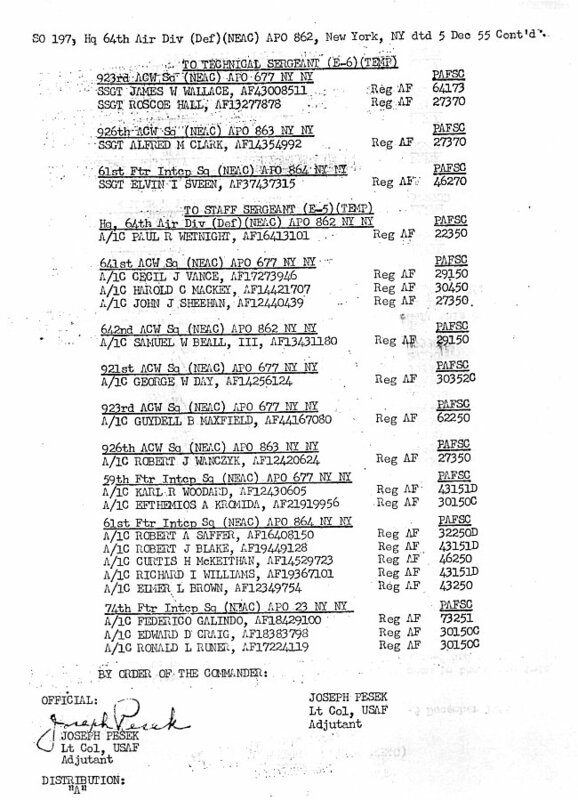 64th Air Division (Defense), Special Orders #75, page 1 of 2 - 6 June 1955. 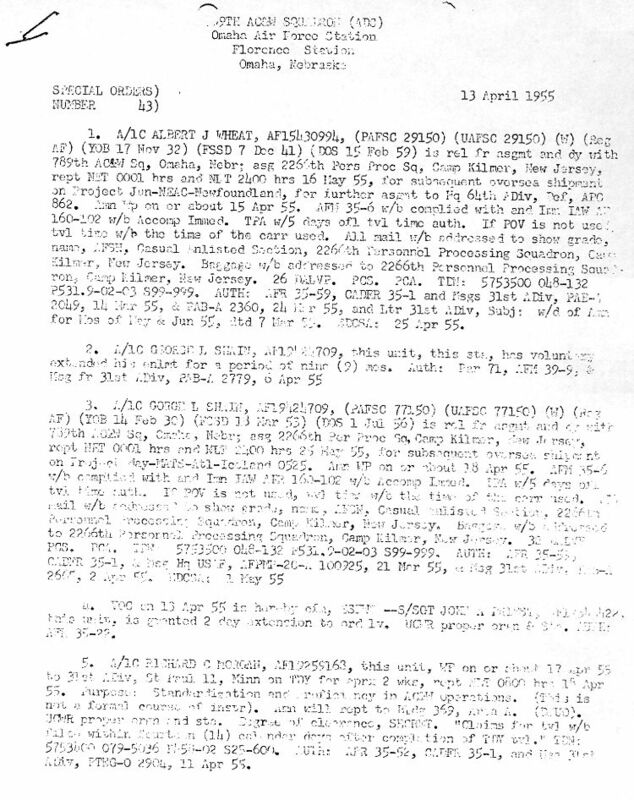 64th Air Division (Defense), Special Orders #75, page 2 of 2 - 6 June 1955. 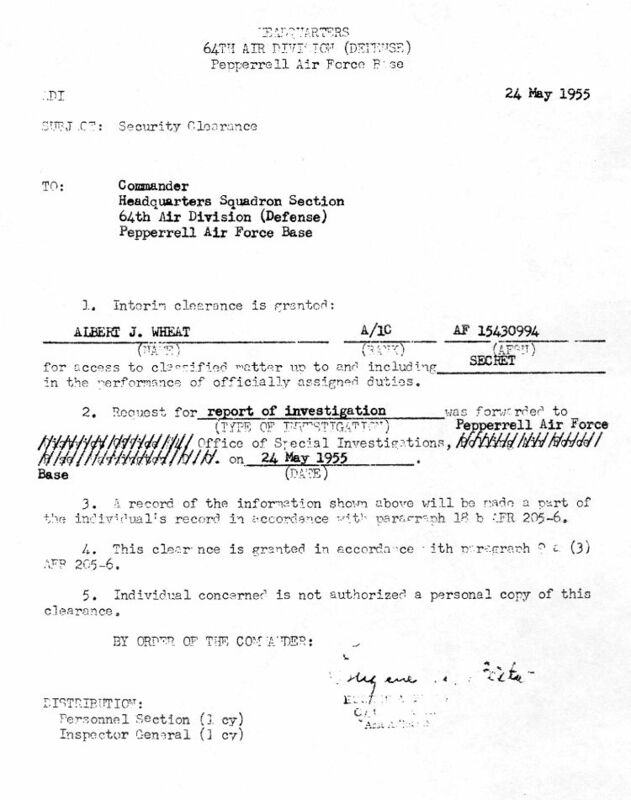 64th Air Division (Defense), Security Clearance - 24 May 1955. 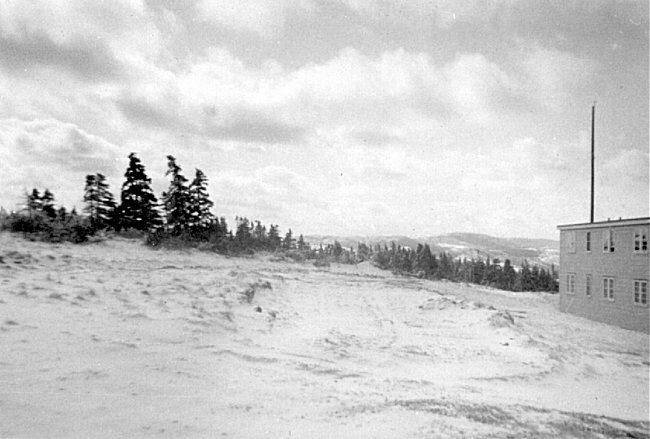 989th AC&W Squadron, Special Order #43. 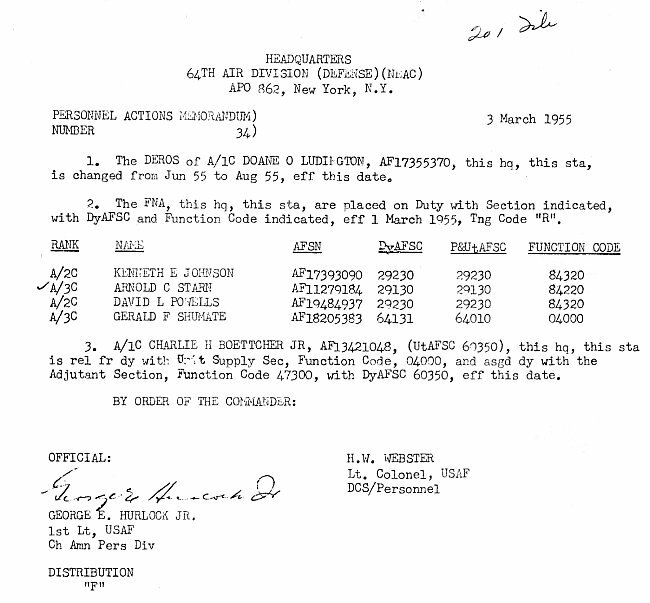 Para 1 - reassignment to 64th Air Division (Defense) - 13 April 1955. 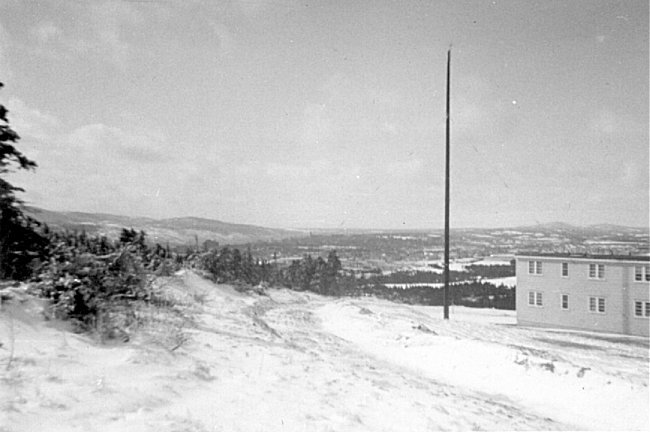 64th Air Division Administration building at White Hills, Pepperrell AFB - April 1955. 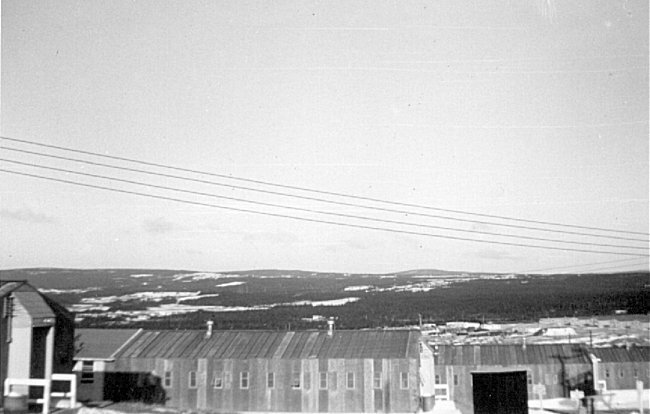 64th Air Division enlisted men's barracks at White Hills, Pepperrell AFB - April 1955. 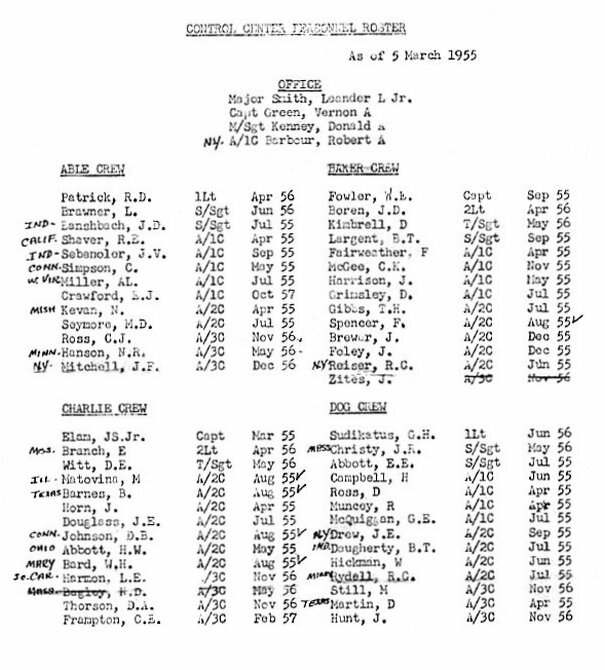 Control Center Personnel Roster - 5 March 1955. 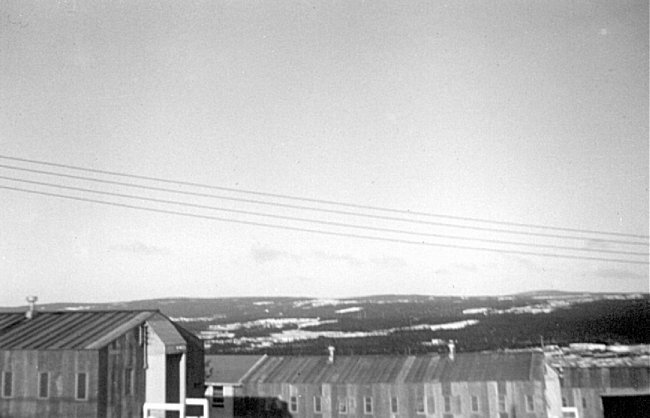 64th Air Division (Defense), Special Orders #34 - 3 March 1955. 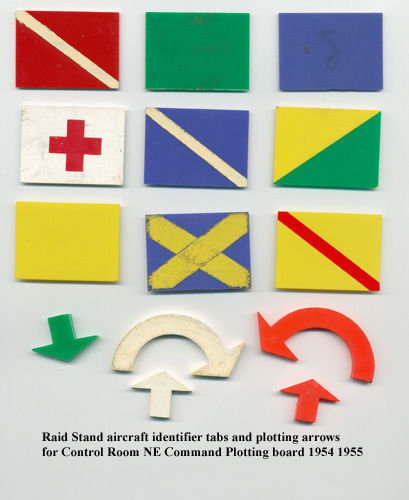 Raid stand identifier tabs and plotting arrows - March 1955. 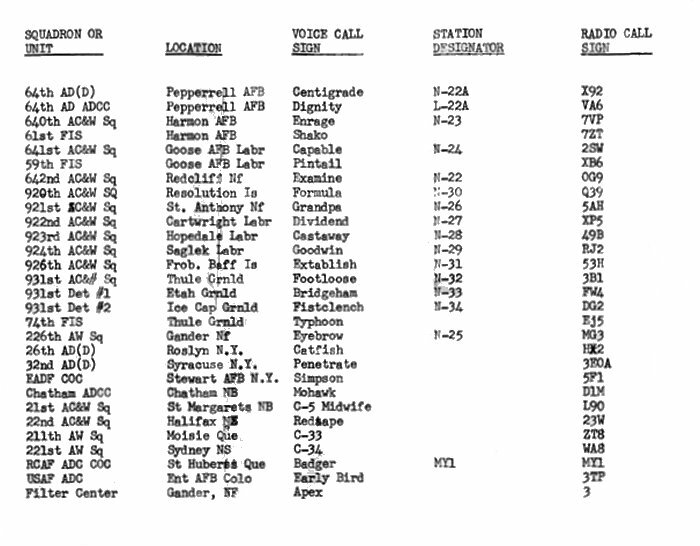 Squadron unit identification and callsign listing - March 1955.